You probably heard how raw organic apple cider vinegar (ACV) can do wonders to our health and beauty (and even at home). Many people swear that apple cider vinegar is a cheap, effective and natural remedy for various conditions such as fungal and yeast infections and many more. However, in this article, we will focus more on the beauty benefits of apple cider vinegar. Apple cider vinegar contains alpha hydroxy acids as well as acetic acid, which helps in gently exfoliating the skin. To apply as facial toner, just mix a tablespoon of apple cider vinegar with two cups of water. Soak a cotton ball and swipe all over the face. Let it dry. Do not rinse. 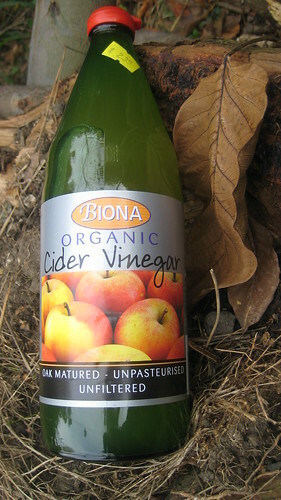 Apple cider vinegar is popular for its anti-fungal properties. Since dandruff is a form of fungal infection, ACV is a good and effective remedy for such condition. In addition, applying apple cider vinegar to the scalp forms an acidic layer, which can help ward off fungal growth. Mix equal parts of water and ACV or add a teaspoon of ACV to your shampoo and use the mixture to wash hair. Hair product residues can build up and cause the hair to go limp and dull. To remove the residues, add two tablespoons of ACV to one cup of water. Douse hair after shampooing and rinsing, just before applying conditioner. Staying too long in a bath can cause moisture and pH level imbalance in our skin. To restore the skin’s natural pH, mix eight ounces of ACV with warm water in a bathtub. Soak for 15 minutes. Shaving can irritate the skin, causing razor bumps to form. To help soothe the skin, moisten a cotton ball with pure apple cider vinegar. Swipe on irritated area and let it dry. To quickly relieve pain and irritation, apply honey first on the affected area before swiping with ACV. Before brushing teeth in the morning, gargle with ACV. It helps kill germs and bacteria as well as it whitens the teeth. Due to ACV’s anti-bacterial and anti-fungal properties, ACV is a good deodorant. It neutralizes odors and kills bacteria that causes bad odor. Apple cider vinegar is good for those with oily and acne prone skin. It absorbs excess oils and kills bacteria. It contains alpha hydroxy acid (glycolic acid), which facilitates superficial peeling and improves inflammatory eruptions. Sunburns can be painful and uncomfortable, especially when pressed. To relieve pain and minimize the formation of blisters, add half a cup of ACV to four cups of water. Soak a towel with this mixture and apply to sunburned areas. Smelly feet? Combine one cup of ACV with four cups of warm water. Soak feet for 15 minutes. One of the many benefits of apple cider vinegar is to remove foot odor as well as any existing fungal infection such as athlete’s foot.